STEVE McQUEEN: Full-Throttle Cool | Z-File, Inc.
Steve McQueen said, “I’m not sure whether I’m an actor who races or a racer who acts.” Fortunately for us, he was the best of both. McQueen left an indelible imprint as one of Hollywood’s sexiest leading men. His masterful film roles in Bullitt, The Great Escape, The Thomas Crown Affair, and Papillion have been often imitated but never repeated. An actor, motorcycle and automobile racer, and all-around gearhead, McQueen also epitomized the American dream, rising from hardscrabble circumstances to become one of the most famous movie stars in the world. 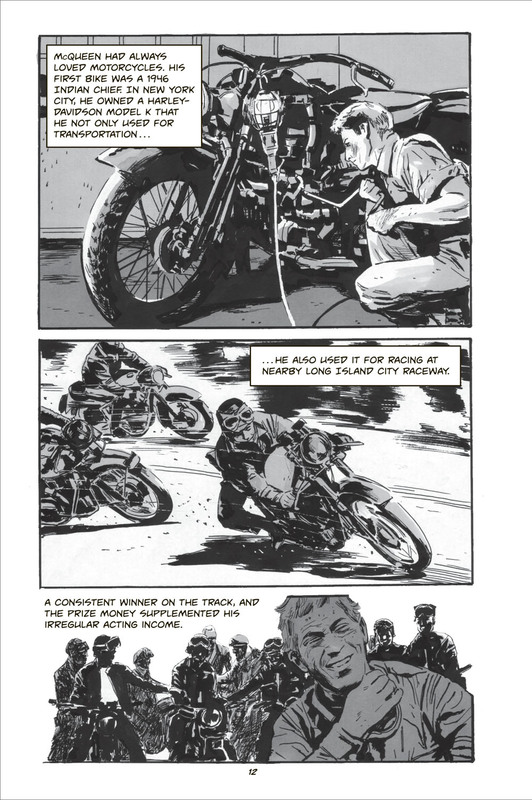 Steve McQueen: Full-Throttle Cool presents McQueen’s life story in an artistic, graphic-novel format. It covers his entire life, from his earliest years growing up in a suburb of Indianapolis to his death from mesothelioma. Learn all about his stunning movie career, in which he defined the antihero archetype. The cool panache he brought to the screen was perhaps only matched by his adrenaline-pumping racing exploits. Get the full measure of both from this book. 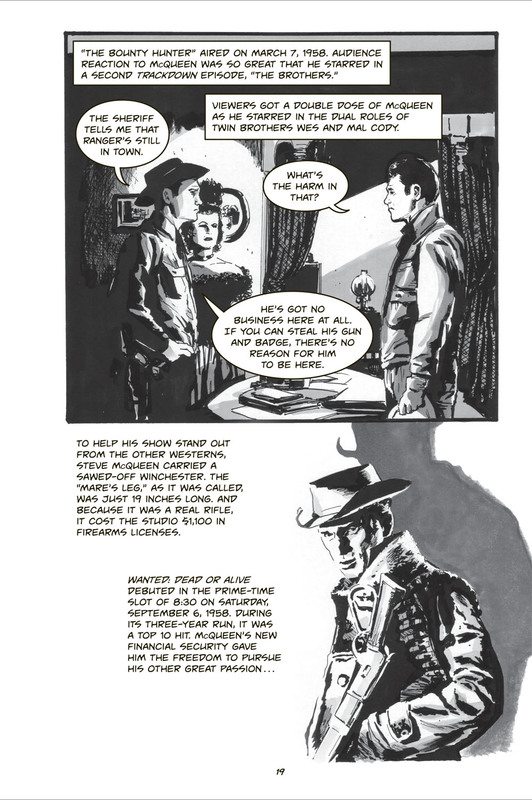 Give me a good biography in a comics format anytime. 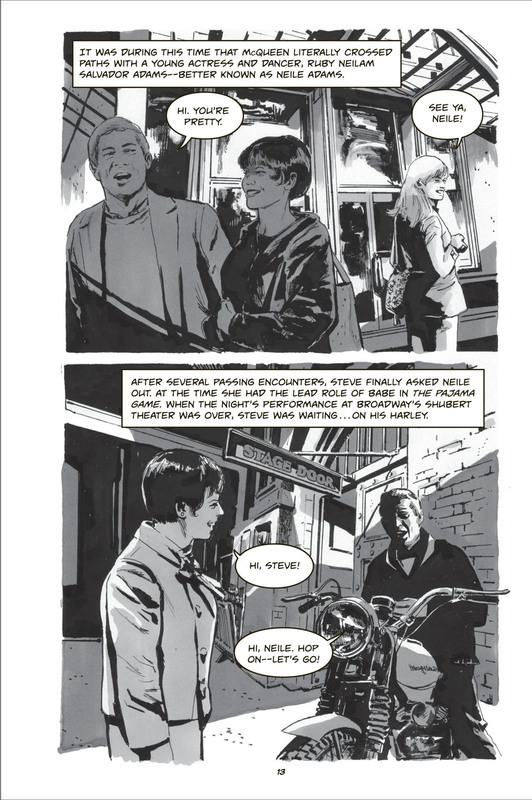 The new graphic novel version of the life of actor and race car driver Steven McQueen is straightforward and appealing. Make no mistake, Steve McQueen was one serious race car driver as “Steve McQueen: Full Throttle Cool,” published by Motorbooks, bears out. 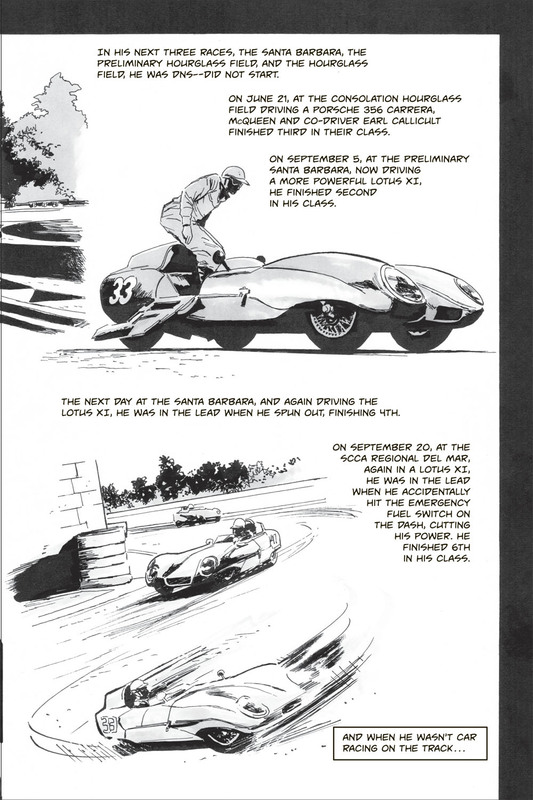 Written by Dwight Jon Zimmerman and illustrated by Greg Scott, we zigzag between the movie set and the race track as the remarkable life of a true legend unfolds. So what makes Steve McQueen: Full Throttle Cool different? 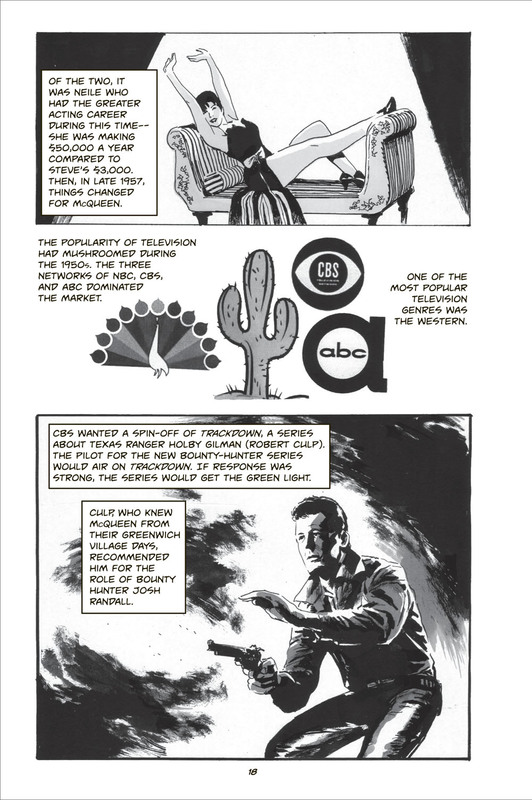 The book’s artistic view of McQueen’s life, developed as a graphic-novel feel by artist Greg Scott, who has been a comic-book artist for both Marvel and DC Comics and carries a long list of credentials, makes for a page-turning read that is hard to put down. The story itself, written by award-winning military writer Dwight Jon Zimmerman, certainly aids in the feel that you must continue reading and can’t put the book down. The book is but 96 pages, yet tells McQueen’s story quite well. 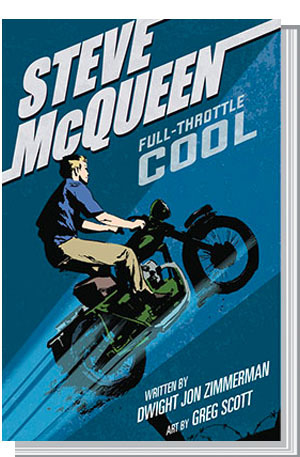 If you’re an avid Steve McQueen fan you need this book in your collection, and if your only knowledge of Steve McQueen come from the movie Bullitt then Steve McQueen: Full-Throttle Cool is an easy read that will entertain and educate you about McQueen’s life, loves, and cinematic contributions. After reading Full-Throttle Cool I have even more appreciation for the life that Steve lead and the type of man that he became after his own personal Great Escape from his early years dominated by abandonment, abuse, trouble with the law & reform school which followed. This . 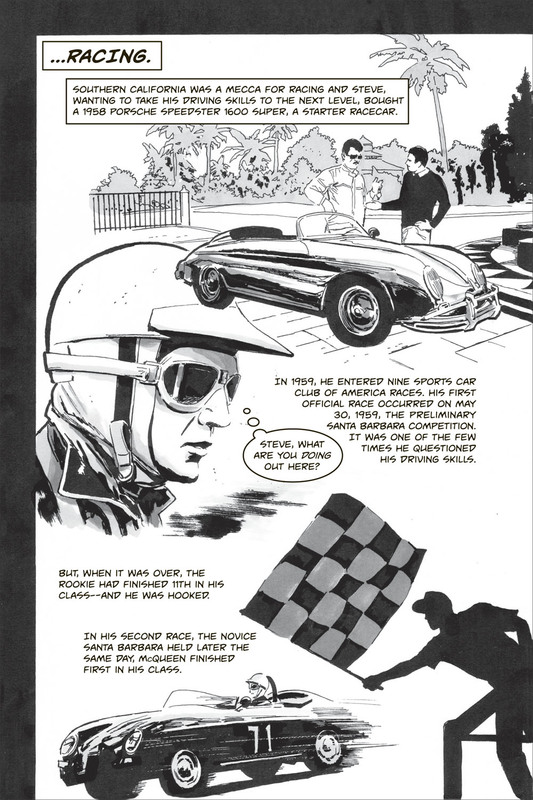 . . easy read on Steve’s life, on and off the track, in and out of the movies, is done in a unique compact, comic book format, with artwork by Gregg Scott, which provides maximum information and pop in a minimum of space and time. Put this on your “Must Read” List!